On one stretch of Troy Street in Spring Valley, four illegal marijuana dispensaries are open for business. Each uses green paint and the ubiquitous green cross to distinguish themselves. To better stand out, some use Google Maps’ red teardrop icon, turned green and with the words “You are Here” in bold lettering. At night, the dispensaries’ storefronts are lit with bright green Christmas lights. This portion of Troy Street has become the region’s de facto green mile — a thoroughfare packed with pot. Four more illegal marijuana dispensaries sit just a short drive away on Campo Road and Dolores Street in Casa de Oro, one of them a stone’s throw from a preschool. A majority of San Diego County voters in 2016 supported Proposition 64, the statewide measure that allowed local municipalities to legalize and regulate recreational marijuana. Legal recreational cannabis dispensaries are now open in the city of San Diego, which has passed its own industry regulations. Nearby La Mesa is in the process of licensing dispensaries, too. But the San Diego County Board of Supervisors voted last year to ban cannabis dispensaries and farms in unincorporated communities like Spring Valley, Casa de Oro and Lakeside. Enforcing the ban, it turns out, has been extremely difficult. Four dispensaries are legally permitted to sell medical cannabis in unincorporated parts of the county. But when the county board of supervisors banned dispensaries, it also said those medical operations needed to shut down by April of 2022. Every other dispensary in unincorporated communities are unlicensed and illegal. A county spokeswoman said they know of at least 38. 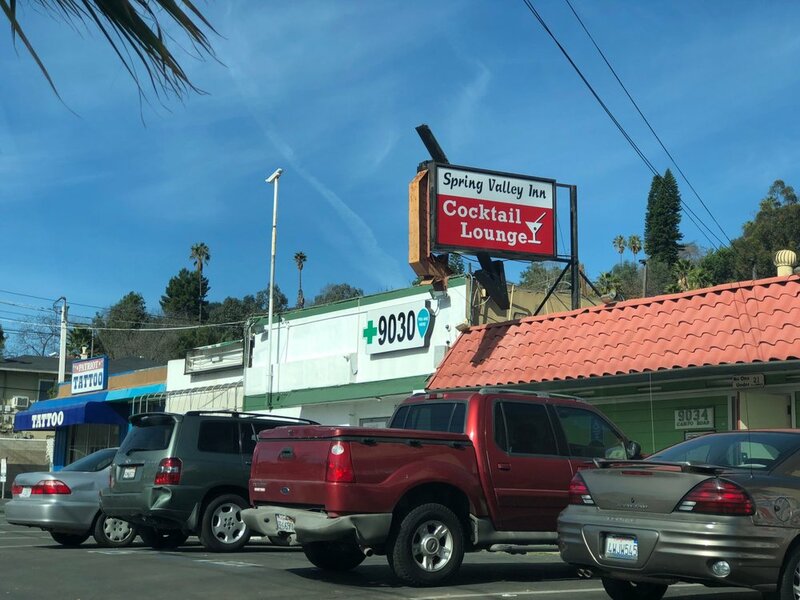 Tina Carlson, the executive director of the Spring Valley Chamber of Commerce, said illegal dispensaries in the unincorporated county are out of control, and local residents and business owners can’t do anything about it. In January, I tagged along to watch San Diego County Sheriff’s Department deputies close down an unlicensed cannabis dispensary in Spring Valley. Called The Bakery, the dispensary opened last year on Birch Street, in the middle of a low-income neighborhood with nearby apartment complexes, single-family homes, a metal fabrication warehouse and a used-car dealership. Months earlier, a neighbor complained that her teenage son was buying cannabis there. The complaint prompted a sheriff’s department investigation. Early on the morning on Jan. 11, Sheriff’s deputies sawed through a large metal gate of the dispensary and walked inside to find a security guard standing in the entrance, hands up and his gun unloaded. Officers detained the guard for a short time and let him go. They confiscated thousands of dollars worth of marijuana, edibles and other paraphernalia, and seized almost $4,000 in cash. 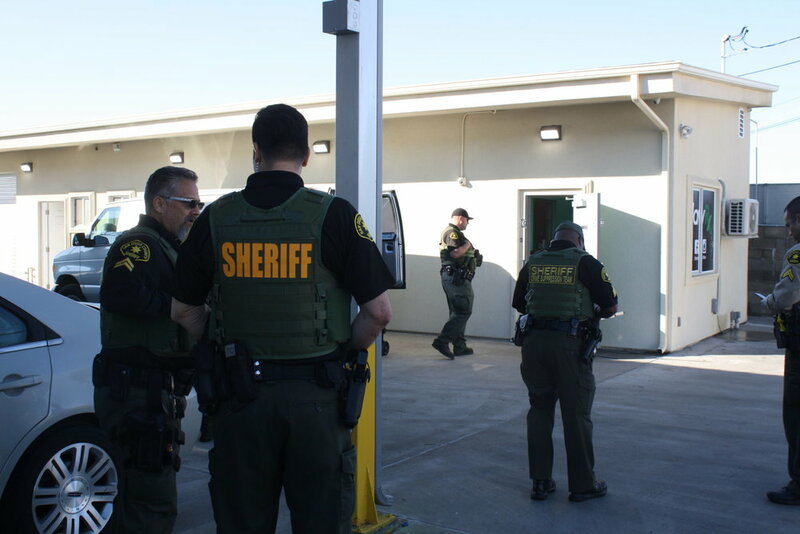 Tom Seiver, a lieutenant at the Sheriff’s Rancho San Diego Station, which patrols Spring Valley, Casa de Oro and other nearby communities, said it takes several deputies many hours to investigate and raid an illegal dispensary. The day of the raid on The Bakery, I counted 10 deputies, two county code compliance officers and a local fire department crew, which was on hand to cut open a safe and ATM. After a raid, deputies have to bag, photograph and categorize everything seized, a painstaking process Seiver said takes at least eight hours. A county spokeswoman said it takes multiple agencies and many man hours to raid a dispensary, but they said the county doesn’t know how much the average raid costs. A Spanish-speaking woman who lives nearby who didn’t want to give her name for fear of backlash from the owner said she was glad it was gone. “The dispensaries shouldn’t be near children, and there are kids here,” she said. Shafik Obeid, an employee at the neighboring used-car dealership, said the dispensary didn’t bother him. He said the owners spent months improving the property and building nice new facilities in place of what used to be a broken-down, empty building. Illegal dispensaries can operate for months or years before they get shut down. County code enforcement is not a proactive process. When community members complain to the county or the San Diego County Sheriff’s Department about an illegal dispensary, the county and sheriff’s department investigate and send out an official cease-and-desist letter. They can also fine the property and dispensary owners up to $50,000 a year. Last year, the Sheriff’s Department sent out 38 cease-and-desist letters countywide to illegal marijuana dispensaries, according to the department. Twenty-one of those letters were issued to addresses in Spring Valley. Those cease-and-desist letters and fines, though, are largely ignored by dispensary owners. It typically takes a raid to shut them down. But even when an illegal dispensary is raided and shut down, it often opens back up in a new location or even in the same location a few days, or hours, later. Seiver said running a cannabis business is so lucrative, and fines and punishment are so limited, that it makes financial sense for illegal dispensaries to reopen. Rarely is anyone arrested during a raid. Seiver said people onsite during a raid are often low-level employees. Plus, Proposition 47, the ballot initiative passed by California voters in 2014, reduced certain drug felonies, including selling marijuana, to misdemeanors. Seiver said finding illegal dispensary owners is difficult; they obscure their identities through LLCs and limit contact with the businesses — which don’t have paper trails because they’re cash only. The county can and has gone after landlords who rent to dispensaries, but it’s difficult to prove a landlord knew they were renting to an illegal dispensary. After a raid, Seiver said, deputies investigate further and send some cases to the district attorney’s office, which decides whether to pursue charges. In the last year, though, the DA’s office has launched just one case against an illegal dispensary in Spring Valley. Currently, there are 14 active investigations in Spring Valley and Casa de Oro, according to the county. Four illegal dispensaries have been raided in the area in 2018. Two of those four dispensaries have already reopened. Seiver said he worries about violent crimes near illegal dispensaries. 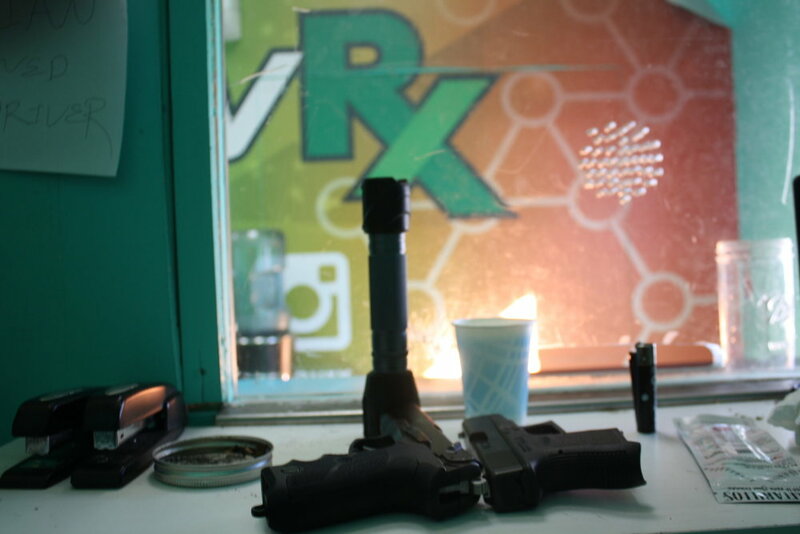 In recent years there’s been a handful of takeover-style robberies and a few shootings at unlicensed dispensaries in Spring Valley and Casa de Oro. Jacob Saunders started selling his friends cannabis in high school. By 23, he’d already run an unlicensed dispensary in National City, worked as a unlicensed cannabis farmer in a rural East County and now works as an employee at an unlicensed dispensary in Casa de Oro. When his son was born, Saunders said he no longer wanted to risk jail time by running illegal cannabis businesses. But he said he’s fine working for someone else because the legal risk is much smaller. He was employed at an unlicensed dispensary when it got raided, and said he walked away without repercussions by pretending he was a patron. At one point, Saunders said three unlicensed dispensaries were open in the same office building in Casa de Oro where he now works. The other two have since been raided and shut down, and he predicts his shop has another three months before it falls to the same fate. Saunders said he looked into opening a legal, licensed dispensary in the city of San Diego, but was taken aback by permitting costs. As Saunders and I talked, a steady stream of customers entered the small dispensary where he works. Saunders said he predicts that about half of the customers don’t even realize the shop is illegal. Before licensed recreational dispensaries opened in San Diego on Jan. 1, the small dispensary where he works was pulling in $20,000 to $30,000 a month. They lost customers who wanted to buy legally, and he said now the shop now makes about $8,000 to $9,000 a month. But he predicts business will go back up. Legal cannabis is more expensive and the prices are expected to continue to rise. Plus, he said, there’s no way licensed shops can meet the demands of the region, so he said unlicensed shops will carry on so long legal shops are capped. Saunders grew up in Spring Valley. He said he thinks the area is a hotbed for illegal dispensaries because real estate is more affordable and landowners are more lenient. He said the county should consider lifting the ban on cannabis businesses in unincorporated communities. County Supervisor Dianne Jacob, whose district includes Spring Valley and Casa de Oro, said she’s aware of the concerns about illegal dispensaries in the unincorporated county, but thinks the ban will eventually be successfully enforced. Seiver said his deputies will continue enforcing the ban as best they can, but he knows they’ll continue to reopen. He said the county’s maximum $50,000 fine isn’t nearly enough to stop illegal dispensary owners, and neither is the threat of misdemeanor charges. “If you’re more interested in making money than committing a misdemeanor, there’s not much stopping the people from the prosecution angle,” he said.